You can reduce radon levels, but the only way to know if your home has high radon levels is to test. 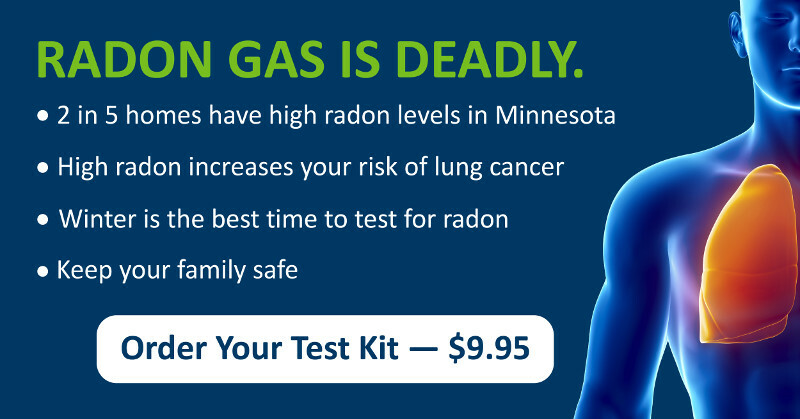 The Minnesota Department of Health is working with Air Chek to offer test kits for only $9.95. This includes postage, analysis and a radon test report. Every 25 minutes, a person in the U.S. dies from radon-related lung cancer. It is the leading environmental cause of cancer deaths and the leading cause of lung cancer among non-smokers. More than 40 percent of Minnesota homes have dangerous levels of radon gas. Radon is odorless, colorless and tasteless. Testing is easy, inexpensive and only takes 3-5 days. Tests should be done in the lowest level of the home that is frequently occupied. Tests should not be done in laundry or utility rooms, kitchens or bathrooms. Any radon tests done during a real estate transaction should be conducted by an MDH licensed Radon Measurement or Radon Mitigation Professional.